I am working with experimental plant eco-physiology of wetland plants with emphasis on traits conferring flood tolerance. Root traits conferring to flood tolerance are mainly related to enhanced internal aeration such as root tissue porosity (to enable gas phase diffusion of oxygen), a barrier to radial oxygen loss (resulting in high internal root pO2 and perhaps also a barrier to phytotoxin intrusion of e.g., H2S and Fe2+). Natural wetland plants are well adapted to soil flooding (waterlogging) and some of them also tolerate partial or complete submergence. The adaptive traits in both roots and shoot can be used to improve flood tolerance of wetland (e.g., rice) and dryland crops so that these are better suited for a changing climate with more floods following torrential rains throughout the growth season. Bundles of aquatic adventitious roots hanging from completely submerged Meionectes brownii in a creek in Western Australia. Some roots have turned pink and later on they may turn green and become photosynthetic. Underwater VDO from a crystal clear gravel pit with submerged terrestrial vegetation. The VDO was taken later winter when all terrestrial vegetation had perished due to frost. In water, the plants are protected from freezing and may grow throughout the winter pending that there is enough light. Underwater VDO of leaf gas films on Glyceria fluitans (NOT Catabrosa aquatica as the VDO says, sorry). G. fluitans possesses superhydrophobic leaf cuticles that retain a thin gas films when submerged. The gas films greatly enhance exchange of O2 and CO2 between tissues and floodwater resulting in better flood tolerance. Wetland plants experience flood events on a regular basis and they possess unexplored traits that enable them to thrive in environments where floods occur on a regular basis or perhaps only once during their life cycle. Many wetland plants respond to flooding by producing new adventitious roots as the primary root system often dies upon soil flooding (waterlogging). 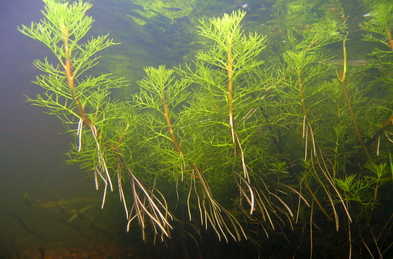 In deeper flood, large bundles of aquatic adventitious roots (see photo above) can form from the submerged part of the stem and some root turn pink or green and become photosynthetic. 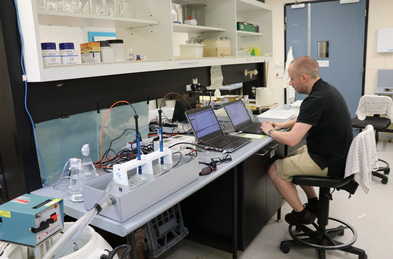 Dennis Konnerup working with root respiration of rice using Unisense MicroResp set-up during a research visit to UWA in Perth 2017. With this equipment, we can measured oxygen uptake by small root segments while exposing them to phytotoxins such as H2S, Fe2+ or organic acids.